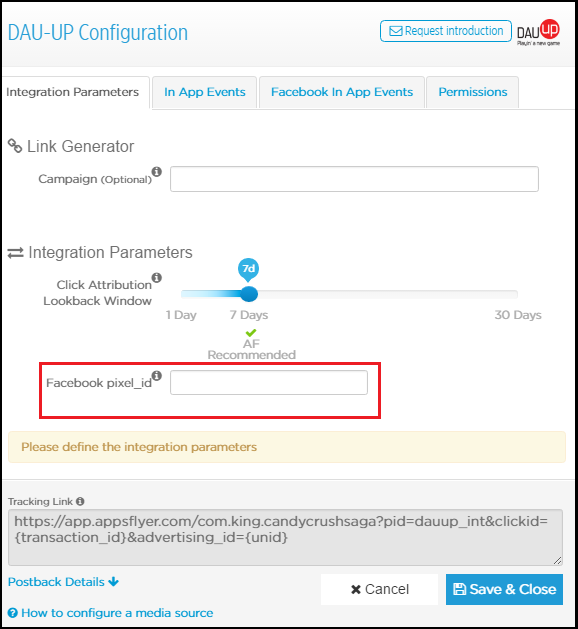 As a prerequisite for the integration with DAU-UP for Facebook, please enable Facebook Ads attribution in AppsFlyer by adding your Facebook App ID under Integrated Partners > Facebook as shown here. Once you have registered your app with AppsFlyer, you must configure the media source you want to work with. To do this, click the app that you want to advertise or select Overview from the drop-down menu. In the Integrated Partners page, select DAU-UP as the media source. You can do this by either scrolling down the page to DAU-UP or entering DAU-UP in the search box. When working with DAU-UP on Facebook, add the Facebook pixel_id provided to you by DAU-UP. This will allow DAU-UP to receive install postbacks from AppsFlyer. Unlike most other media sources for Facebook there is no need to generate a Tracking URL as this is not needed in AppsFlyer's integration with Facebook. 1. To allow DAU-UP to receive data on Facebook in-app events please press the Facebook In-App Events tab. 2. Fill in the pixel_id text box with the same name as in the Integration Parameters tab. 3. Turn on the Send in-app events to DAU-UP button. 4. Map the SDK Events (chose from the drop down menu created according to the events created by you in the AppsFlyer SDK) you want to send to DAU-UP. 5. Click the Send Value check box if the in-app event has a monetary value that you wish to send to DAU-UP. 6. You can add as many SDK events as you want by clicking the +Click to add in-app event mapping. 1. 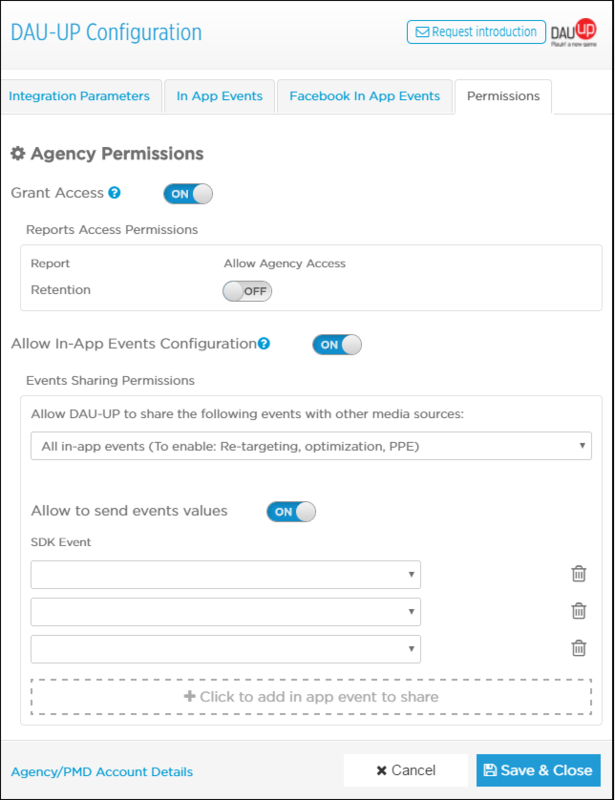 To connect your app to DAU-UP's account press the Permissions tab and switch the Grant Partner Access button from off to on. 3. 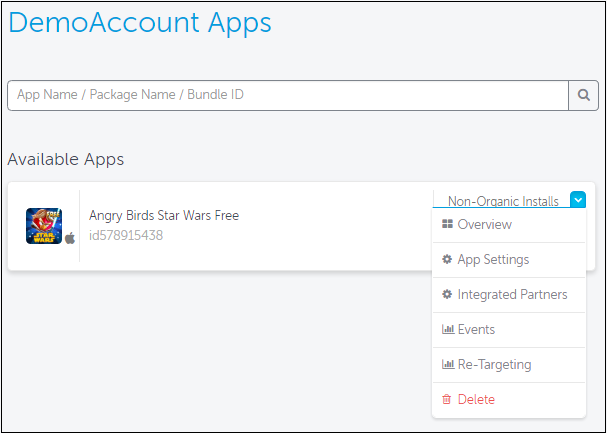 To allow to configure in-app events grant access to in-app events and allow to select specific events to configure. 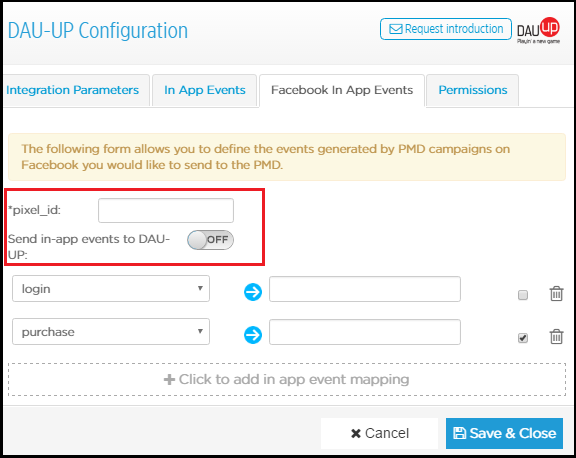 You must select which events Dauup can configure. 2. Press Save & Close.